Springtime Treat Cup Gift Basket & Card! Simply Adorned Charm Case & Matching Charm! Mini Accordion Album & Card! 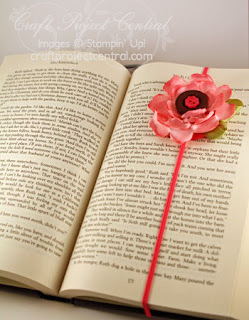 Bungee Bookmark with Heated Ribbon Flower! Easter Cadbury Egg Box & Card! It's time to play with the Stamp-A-Holics. This inspiration challenge is brought to us by Nancy. 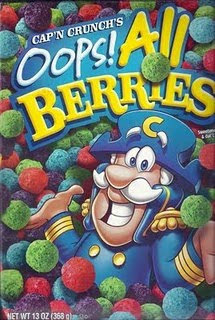 The colors to play with are Not Quite Navy, Cherry Cobbler, Wild Wasabi and a touch of Concord Crush! Are you up for the challenge? And here is my take...I wasn't sure how to pair my colors... Definitely will have to try this color combo again! 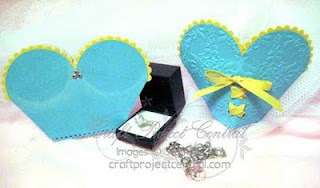 Here is a cute little box that would make great favors for a bridal shower! 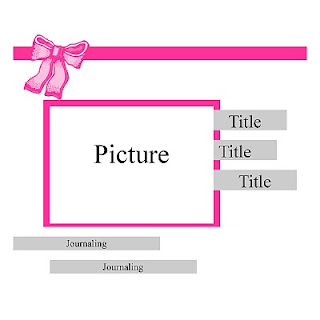 Use the matching card as a cute bridal shower invite! Or change up the theme and colors and use it for other types of parties. 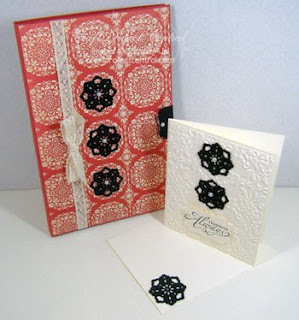 The possibilities are endless when you change the colors, embossing folders and more! This is the project I submitted to CraftProjectCentral. 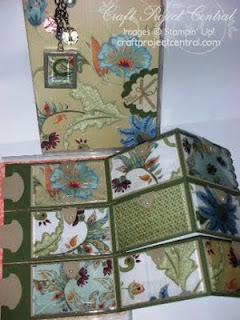 If you would like to learn how to make this and many more GREAT projects subscribe to April 2011. This fun and springy basket is a great way to wrap up a gift of shower gel, body lotion, bubble bath or body spray, along with the added surprise of a sweet treat for the recipient. Perfect for Mother’s Day, a birthday, a gift at the office or just something special to brighten a friend’s day. 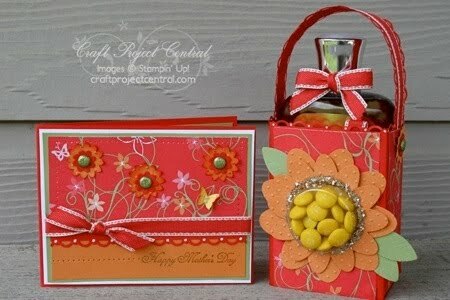 This project also includes directions for a coordinating card! This project is also a great class or club project! This springtime gift project comes to you designed by Ann Marie. To get the instructions for this fun project subscribe to April 2011 CraftProjectCentral. 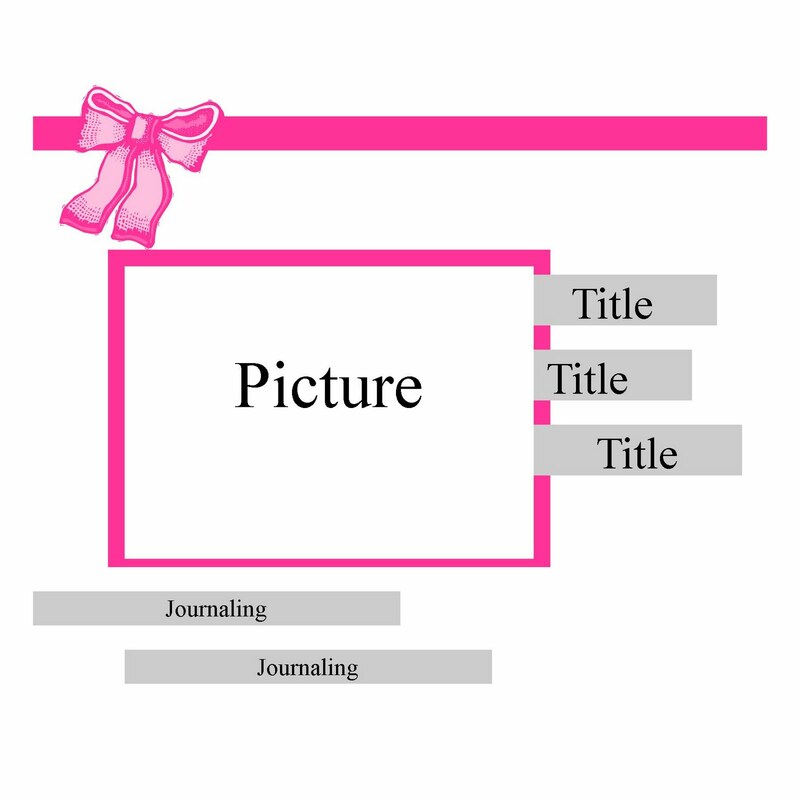 Here is an Elegant Stationery Set for you to give as a gift to your friends, co-workers, kids’ teachers, etc. It’s also a great set to have on hand for yourself! This elegant and easy project is great for classes and clubs as well! This elegant project was designed by Tammy. subscribe to CraftProjectCentral April 2011. Hola Amigas. It's Diva Time! So how are you doing? I can't believe this weather. One day it's sweltering hot (my kind of weather) and then its freezing again...Today and yesterday it's been raining...Well many asked about my first meet and greet with Dawn Raspas. I am a Designer for her so I was getting some goodies for our next session. I also spoke to her about this weekend. I am going to her Shoebox Swap A Thon in Mahwah, NJ. It's going to be first time at a SU event as I have never been to Convention or Regionals. I am really excited. But also nervous as I have never been away from Joaquin and Solimar for so long and this is for the whole weekend. YIKES! At least it's only 1 hour 30 minutes away...Just in Case! Here is my interpretation of the sketch for this week. Gotta LOVE this new Summer Mini DSP. Good Morning Amigas! How is everyone this morning? It's that time again! I get to give away 2 free passes to Inkspirations 4U. Do you want to win? I would like for you to leave me a comment and tell me something that you would like to learn how to do? A new technique, a fun fold, a 3d item...You get the point...That is all and I will pick two winners using random.org on Monday, April 18th. Hopefully you've had a chance to check out Stampin' Up! 's Simply Adorned line of high-quality charms that come in a variety of shapes and sizes and are the perfect little showcase for your artistic talents! The charms are locket-style with hinges that let you insert your artwork or photos. And once you start creating the inserts, it's hard to stop!! So you'll definitely want to make this charm (insert) case to store your artwork in when you're not wearing it!! Simply Adorned charms, inserts (your artwork), and this beautiful case make a great handmade gift (Mother's Day is coming up!). This is also makes for a very fun and unique class project!! To get the instructions for this fabulous project designed by Kris, just head on over to Craft Project Central, subscribe to April and meet the other requirements for qualifying for the bonus project. Hola Amigas! Happy Friday! Where did the week go? Today I am REALLY excited as I am going to meet Dawn Raspas for the first time...YEAH! I still remember when she won #1 Demonstrator of the Year. Hubby is away AGAIN so I rented Tangled and I will order a pizza and snuggle with Solimar and Joaquin. Well its time for you to play with the Stamp A Holics. We have a color challenge from my SAH sister Mitzi Lutrull. I love this color combo as you can do both masculine and feminine...Which will you choose? What do you think? 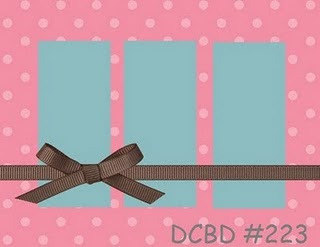 I am not sure about the bow but without it my card looked so pain. Any suggestions? I hope you will play along with us. I don’t know about you, but I have a hard time coming up with masculine projects and cards! Well here’s one! Give this super-cute mini album (that will even fit in a back pocket) and matching card to that special boy in your life. He will love this small album that can hold special photos and other memorabilia. To get the instructions for this fabulous project designed by Monika, just head on over to Craft Project Central, and subscribe to April! Good Morning Amigas! How is everyone enjoying April? April Showers bring May Flowers! I can't wait for the weather to JUST BREAK and be NICE all the time! 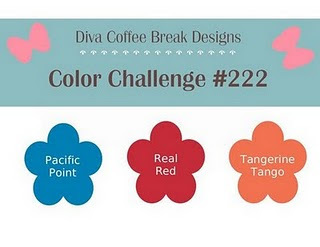 Well I hope you will play along with this GREAT color challenge. I used a Sneak Peak set called Strength & Hope. What do you think? I stamped the butterfly on Whisper White. 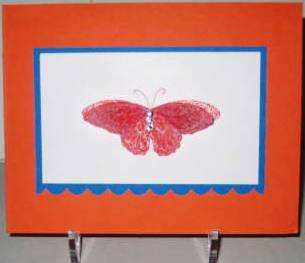 I also stamped the butterfly and cut it out of vellum and just adhered the bottom wings for a 3D effect This type of card is called Clean & Simple (CAS). Here’s the perfect way to dress up a gift for Mother’s Day or for your favorite book lover! The bungee bookmark stays put in your book so you never lose your place. Just stretch the elastic band around the pages you’ve read and close your book! Embellishing the Bungee Bookmark is limited only by your imagination! The Heated Ribbon Fower adds an elegant touch to this bookmark! Tutorial includes instructions for using your bookmark as a pretty bow for a gift package, and a beautiful matching card! This fabulous and fun project comes to you designed by Julie Edmonds. To get the instructions for Julie’s project, just subscribe to April, and please leave Julie a comment on her project!! Easter is just three short weeks away!! Have you made a little something for the kids, their teachers, your co-workers, babysitters, neighbors, etc.?!? 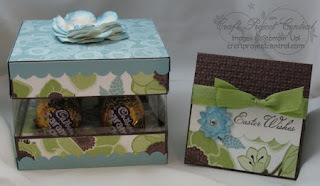 Well this beautiful and clever box is a perfect way to present four chocolate Cadbury eggs!! The insert holds the eggs in place and the removable top makes it easy to open and close. Remove the insert and you can fill the box with other treats! Makes a fun class or club project as well!! 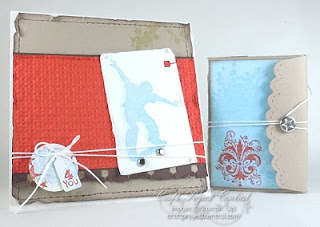 This fun and fabulous project comes to you designed by Kim! Please see Craft Project Central for more information! Solimar and Bella had their very FIRST dance. These girls are inseperable. Here they are taking a break from dancing. Aren't they TOO CUTE?